nesdev.com • View topic - No hype for Sydney Hunter? No hype for Sydney Hunter? Post subject: No hype for Sydney Hunter? No hype for Sydney Hunter new SNES game? I believed it was programmed by Frenchman Alekmaul? Did he ever post here? Post subject: Re: No hype for Sydney Hunter? I thought it wasn't finished. Looks like they made their first production last week, and are shipping out now. A Md version is currently developed by alekmaul. 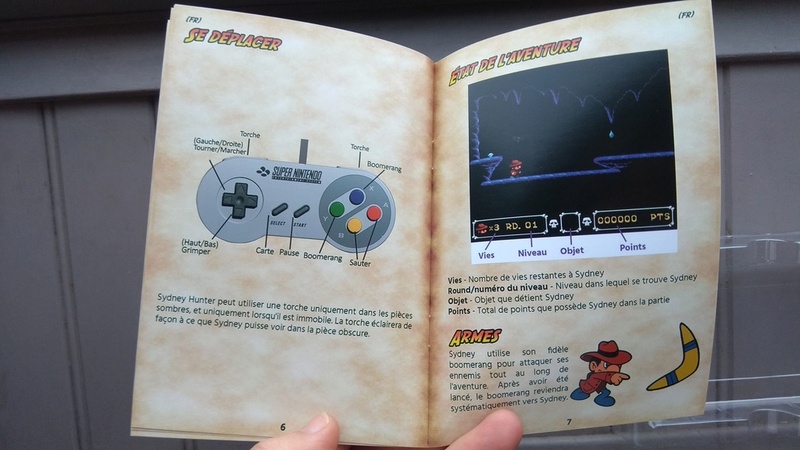 Sydney Hunter is arguably one of the most impressive SNES homebrew released. The package is very qualitative - it's not made with cheap chinese shells. 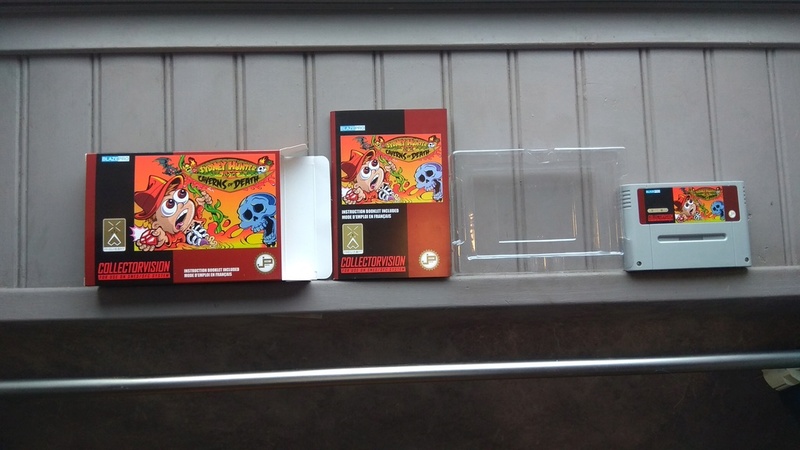 Instead, the box, the shell, the manual have all been manufactured specifically for this game and looks like the original ones. The game itself is apparently pretty cool too. It's a very challenging platform game with cute graphic and music. The goal is to explore caves spanning over many screens in order to retrieve specific items to go to the next levels. There is 10 levels in total. Here is a video showing the "unboxing" of the PAL version of the game (0:00 - 11:00) alongside with a detailed gameplay video (starting at 11:00). 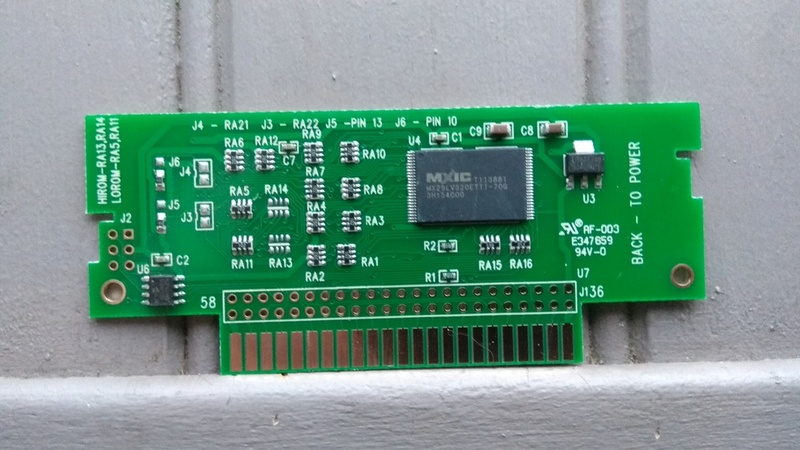 And the most impressive feat is that the game was developed by a single developer, AlekMaul, using a combination of ASM and C code (with PVSNESlib). Congrats @alekmaul for releasing such a polished SNES game! This review pisses me off a little bit. "Graphics-The graphics themselves are nothing to write home about. Aside from a few extra colors and an animation of the "boss" skeleton dying, it looks like stuff that could be done on the NES." "Level Design...a lot of recycled screens...lazy"
I think the graphics look fine, probably better than I can do. There are lighting effects and smooth moving lava, far better than the NES can do. So I guess there's no space in the North American market for platformers with TurboGrafx-16 graphics (more than 4 colors per tile but no parallax). The NES isn't powerful enough, the Super NES is too powerful, and the TG16 isn't common enough. If I still had an SNES I'd be interested. They don't sell a ROM though, and I guess there's a Switch version coming but I don't have one of those either. I'm a little bit stoked for the NES version though, whenever that arrives. I hear what you're saying, although I don't mind brutally honest reviews. Most of us that make games realize the amount of crazy effort that goes into a game like this, so I'm going to be impressed no matter what, but if he's trying to give it a review based on just the players' perspective, I think it's fair to nitpick things like that. Similarly, the existence of so many NES homebrew games brings me a lot of joy, but an honest review of a lot of the games would have plenty to critique. Many (including my own) just aren't that great compared to commercial games. I think it's ok for reviews like that to exist, but just as ok for us to shrug them off and say "so what if you don't like the graphics? The fact that this game exists is AWESOME"
One guy's review doesn't mean there's no space in the market. This should give you some idea of what the current mindset is of people gaming today. Even folks "our" age (40s, or late 30s) who were around for the NES and SNES launches, and grew up with them, have trouble not comparing the quality of retro games (esp. homebrew) to "other stuff" out on the market. What used to be pretty black-and-white is now all convoluted, particularly with the introduction of "pixel games" that run on PCs (often indie games on Steam). Many of them are gorgeous, but way too vast/complicated -- yet will describe themselves as "NES-like" or "classic retro" or "8-bit" (another one that gets me riled up: "Metroidvania") when in fact the entire game may resemble something you'd find in last-gen SNES or more likely PlayStation: graphics too complex (common one is saying "NES-like" but then not having anything even remotely like an attribute table limitation), levels too large, animations too smooth, excess sprites (count or size), use/requirement of analog sticks, and so on. Many have truly forgotten what the actual limitations were, how the actual systems they're referencing felt, etc..
My opinion? Sydney Hunter is great. I don't see anything "NES-like" about it -- it totally looks like a SNES or TG16/PC Engine title. It's wonderful to see people putting some new stuff out for the SNES -- and it puts an especially big smile on my face because it brings me back to early homebrew efforts in 1993 or thereabouts. It was extremely uncommon to find a completed homebrew at that time (most were general demos (hot in the 80s/90s), or sometimes little games -- an example of a good one is the 4-player Multitap Asteroids-like game called Shoot Your Load from Anthrax). So to see some NOW is wonderful. Unlike low-resolution, which is an aesthetic, "Igavania" or "Metroidvania" is an actual genre of exploration-oriented platformers inspired by Metroid and Castlevania: Symphony of the Night. It's called "Igavania" after Symphony co-director Koji Igarashi. I tend to drag out that genre in discussions of mobile gaming on Slashdot.org because unlike more linear platformers, an Igavania can't be adapted to a touch screen by turning it into a continuous runner like Rayman Jungle Run or Super Mario Run, treating the whole touch screen as the A Button. Large levels are very possible; it's more a function of memory size and how much you trust the player to take blind leaps. Blaster Master has sixteen levels, each up to 72 screens (2048x2048 pixels). If you want me to dig up the total count of screens in Haunted: Halloween '85 and its sequel, I could probably do that. That's also a function of memory size. As long as a game actually uses discrete cels with baked inbetweening, not runtime inbetweening like a Flash game, it's technically practical to animate four characters roughly as big as Super Mario at 12 fps, the same rate that Disney cel animated movies run. The primary limit to a sprite cel double-buffering system like that of Haunted: Halloween '85 is CHR RAM bandwidth, and a game with CHR ROM or larger CHR RAM (The Curse of Possum Hollow has the latter) could push that a bit harder. Optional analog sticks I'm willing to forgive, as 8-bit arcade games were already using pot paddles (Pong), spinners (Arkanoid), trackballs (Missile Command), and the so-called "49-way joystick" (Sinistar) around that time. The Atari 5200 SuperSystem came with an analog stick, and a trackball was available. Many Super NES games support a trackball, as do two NES games (Thwaite and Sliding Blaster). But guys I totes went to PS and selected the 8-bit graphics options its totes 8-bit PS said so! Would love to make a video on it... point out that any 8bit games is actually 32bit and not a bit less Does that NPC have more than 2 frames of animation, not (console)8bit Whats that 3 layers of parallax you say.. did you just zoom? There is a download option coming for the C64 version, not seen anything about the SNES version. The publisher seems to be a bit worried about download ROMs. Even though the crackers already have the C64 version so that it a moot point. Good to see they actually have the PAL version on their site now, when I looked a while ago it was to some other site that looked like a scam. Still shipping from Canada is high and this has stiff competition from Joe Gunn and Atlantis well maybe just Atlantis, we seem to be swamped in flip screen temple exploration games at the moment. The C64 is able to get away with "spectrum" level games, seems odd that the SNES is not able to get away with SMS level games. I however feel that the problem is gameplay level rather than graphics, sure they can say its a bit NES+ even when its NES+++ but still I think the issue is more how limited the gameplay is/repetitive the levels are. People will forgive lack of eye candy if they are doing more and having fun. I think people have a line that forms the Pretty vs Stuff to do. To which if you have more things to do, people understand that making art for it takes time and room, but if you have less things to do that allows you to have more graphics. I wonder if it really is that glitchy or they are maybe running the wrong version of the game? But then I think if people are going to put up with making space for a cart and box etc then it has to earn that slot on a shelf to which DKC2+ or no thanks. I think this also speaks to how "homebrew" is perceived, for example Pat the NES punk will point out that most NES homebrew is not even as good as the average stuff from back in the day and hence if you want something new to play on the NES there is a pile of stuff you would have missed back in the day that will be better than most "here I did a thing and showed off a trick homebrew". Meanwhile on the C64 1~3 team people working at home is how the industry ran, so we don't have a "this is a real game and this is something some hacker made at home" and games that are 83 spec are permitted along with 18 spec The question is what do we need to get consoles treated equally? I tend to drag out that genre in discussions of mobile gaming on Slashdot.org because unlike more linear platformers, an Igavania can't be adapted to a touch screen by turning it into a continuous runner like Rayman Jungle Run or Super Mario Run, treating the whole touch screen as the A Button. Yes they can....I made an Android game based exactly on this description - a "metroidvania based on the tap-to-jump runner mechanics"
Not wanting to be an annoying guy, don't 3v ROMs damage retro systems?